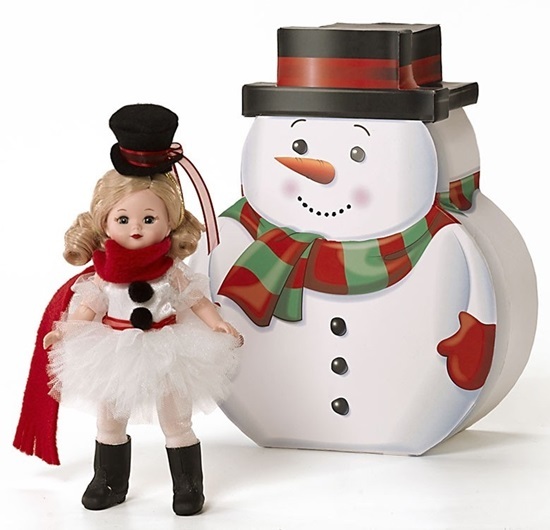 Snowman Ballerina makes an appearance in the 2015 Madame Alexander line as an 8 inch Wendy doll. She is fully-articulated with a vinyl body. She wears a snowman inspired ballerina ensemble including a fun top hat, scarf and boots. She is ready to show off in the Snowman ballet as the star of the show! Also available in an African American version. As a special surprise, she arrives in a snowman box, rather than a traditional Madame Alexander box. A 2015 Madame Alexander doll. Suitable for ages 14 and up.